When patients with Ebola are sickest, they are the most infectious. There's virus in the body fluids that they create. It's as if a very sick Ebola patient is covered in sticky syrup or messy cake flour. No matter what, syrup ends up on anything. Healthcare workers use PPE (Personal Protective Equipment) to keep the syrup from getting on themselves. That is to say, sick patients have high amounts virus in their blood and body fluids. This is the syrup. Their illness produces lots of body fluids - vomit, diarrhea, even bleeding. That's the copious amounts of syrup that can get on anything. Healthcare providers have to carefully cover themselves to avoid any contact with these fluids. They also have to carefully remove their protective gear. Imagine trying to take off a pair of gloves. It's hard to remove the first glove without your other gloved hand touching your skin. It's hard to remove the second glove without your newly bare hand touching the outside of the glove. The syrup could get on your hand. There are extra precautions taken to avoid this risk. Double gloves are used. Providers may dip their gloved hands in chlorine between each patient exam. Training and practice also matter. Taking on and off double gloves should become second nature. These risks are different from what the general public should face - if patients are cared for. Before a patient has symptoms, they are not infectious. Once they develop symptoms, their symptoms are mild and less infectious. The risk of infection mirrors disease severity. Less sick, less infectious. If patients are able to recognize symptoms after exposure, seek and find care, the sickest should be in hospitals when they are the most infectious. 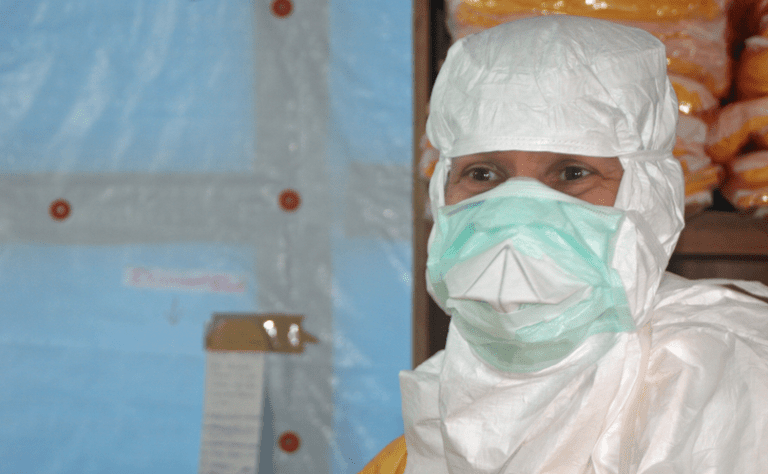 Health workers wear gloves, a gown (fluid resistant or impermeable), goggles or a face shield, and a face mask. However, if body fluids may be present - such as diarrhea, vomiting, bleeding, professionals should double glove and wear disposable shoe covers, leg coverings. Many go beyond the CDC recommendations. Many use hoods so necks aren't exposed or aprons for splashes. They may use rubber boots not taken elsewhere. Others use full suits, i.e. hazmat style. Masks prevent even the tiniest body fluid droplets from being splashed, sprayed, or dripped into someone's mouth. Many use special masks that do not let fine particles in - such as N95 masks that also prevent fine airborne particles. Some use Powered air purifying respirator - the respirator devices often seen in photos. Ebola is not airborne. Ebola has not been shown to float long distances in the air infecting people across a bus or a crowded market. Instead, if say a patient vomits blood, tiny fluid droplets may be propelled. Procedures may spray tiny droplets - such as intubating a patient or pulling out a nasogastric tube. Medical professionals want no mistakes and use masks providing the best barrier against any tiny amounts of fluid. Taking protective gear on and off may seem like a no-brainer - but that's the problem. It isn't a no-brainer. It requires attention. Items should be removed in a specific order. Otherwise, a bare hand may touch soiled clothing, unnoticed. To avoid mistakes, "donning and doffing" protective gear should be directed by another individual. Likewise, healthcare workers should not work alone - to avoid unseen, minor contaminations. Known Ebola patients will have their own private rooms or stay only with other patients proven to have Ebola. Healthcare providers often enter, walk through, and leave patient areas in only one direction. If possible, they will enter from one side and leave from another to avoid tracking infectious material and contaminating the suiting up area. Healthcare workers need to limit time in the patient area. They should plan their work in advance. Working with PPE is difficult - hot and difficult to move in - which can limit caregiver's decision-making and work. Providers should avoid touching patients as much as possible. They may wash gloved hands in chlorine between patients if seeing multiple patients. They should not place IVs if there is any risk; an uncooperative patient, an unassisted IV, or poor lighting can be risks. Likewise, help should be obtained for agitated patients, cleaning or lifting patients. Everyone should know their limits. Cleaning personnel are needed to avoid having fomites, objects that can transfer infection from one to another. Patients should have their own private bathroom area and not share bathrooms with others. Disinfectants are needed for waste disposal. All visible contamination should be disinfected. Sharps (ie needles) need careful disposal. It is important that protocols are learned thoroughly. Protocols that change can be confusing and lead to errors. Treating Ebola in hot protective gear is stressful enough. Nonetheless, Ebola can't be seen. Little flecks of fluid can still contaminate someone's hands when they don't know it. Health professionals who were very careful still found themselves, in very rare cases, infected.